The airport continues its string of 2016 successes with several ongoing enhancements. Phoenix Sky Harbor Airport’s Terminal 3 is in progress on a massive upgrade. The terminal remains open while offering a consolidated security checkpoint and new ticket counters and amenities. (Photo courtesy of Sky Harbor). Whether you’re a traveler, business owner or resident, it’s an exciting time to be in Arizona. There’s so much going on! Thousands of out-of-town visitors will flock to the Valley for the NCAA Final Four championship games at University of Phoenix Stadium and to related festivities in April. Even more visitors are filling Arizona’s 10 spring training ballparks, which host 15 Major League Baseball teams. According to the Cactus League, six out of every 10 fans attending spring baseball games travel to the Valley from outside of Arizona, with many passing through Phoenix Sky Harbor International Airport and contributing to the airport’s $79 million daily economic impact. 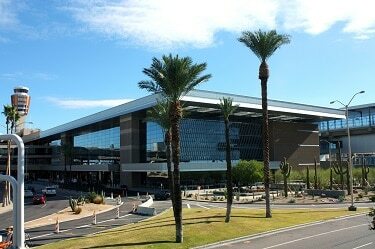 The airport itself is also an area of excitement and activity for travelers and Arizonans alike, as it is the middle of exciting renovations aimed directly at improving the airport experience for its 44 million annual passengers. 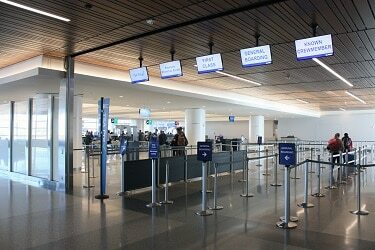 Sky Harbor opened recently the first phase of its newly modernized Terminal 3, with a consolidated security checkpoint and new, versatile airline ticket counters. The second phase will include the replacement of the current South Concourse with a new 15-gate South Concourse and new customer amenities. Completion is expected in late 2018 or early 2019. The final phase, expected to be completed in 2020, will include an upgraded North Concourse featuring new shops, restaurants and amenities. Terminal 4, Sky Harbor’s busiest, is undergoing the first phase of a retail renovation that will bring a mix of nationally recognized name brands and local/regional concepts to the airport. Many new retail locations have already opened. Additional merchants include: 12 News, Brooks Brothers, Bunky Boutique, Connections, Fire CZ, Hudson, iStore, Roosevelt Row and XpresSpa. Improving retail and dining offerings and increasing the speed and quality of customer service is always the top priority at Sky Harbor. For information on these and other projects, visit skyharbor.com and follow the airport on Twitter or Facebook @PHXSkyHarbor.